Seth Downs has held the position of Team Captain for longer than any other team member, and continually provides us with an example to strive for. His strength is matched by his agility and determination. Seth ranked third place at the April StarCon competition with the proto-VUC. Robert Rapplean is the founder and sensei and runs the DuSaQ (Klingon for "school") with an eye for advancement and a driving energy. 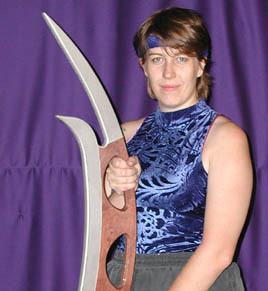 Rob has proven himself in the arena by taking 1st place at a Bat'leth competition three years ago. 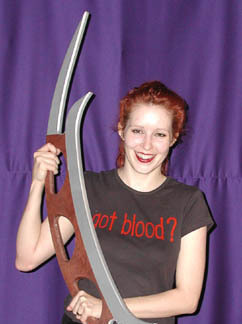 Brady Henderson, who recently won 3rd place at the MileHiCon 34 Bat'leth Tournament - Advanced Level in October '02, has provided us with the first distinct fighting style - "The Scorpion" - mixing lightning quick attack speed with incredible responsivness for defense. Watch out for Brady or you'll be stung too! Tiffany Rapplean was the first female member, and continues to benefit the group with her vast knowledge of teaching methodology. Never a bad attitude Tiffany always provides the team a smile when things start to get a bit too intense. 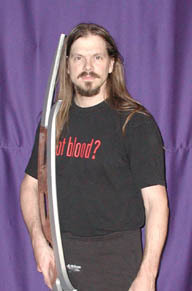 Jim Vance, who recently won 2nd place at the MileHiCon 34 Bat'leth Tournament - Advanced Level in October '02, is a continual inspiration, and currently holds the record for most Bat'leths broken (three + two other member's). 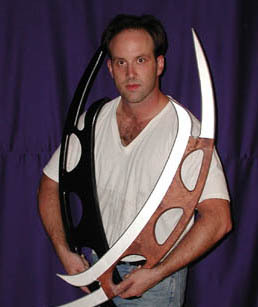 With just a hint of bottled rage behind his fighting attitude Jim promises not to use his real bladed & battle worthy Bat'leth in competition sparring or tournaments! Verina Murphy is our most recent member, and she faces our lessons with amazing persistence and bravery. Utilizing one of the "battle weight" practice Bat'leths, Varina can whip the competition weapons around like they were toys! 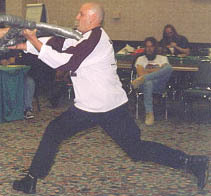 Steve Colligan is a member of a Klingon House in the Denver-Metro area and one of the organizers of the Bat'leth tournament at the annual Denver StarCon. 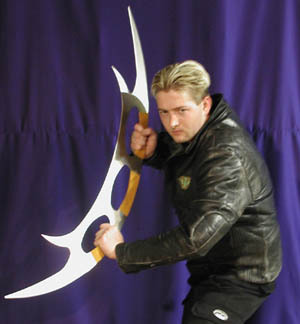 He was the guy that scored first place at the DragonCon Bat'leth tournament against Vance, and now has just recently joined the VUC as a visiting combatan. 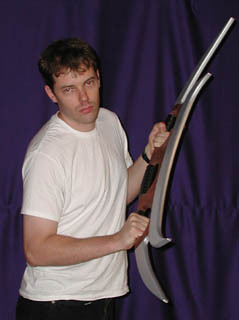 His unique fighting style and speed have begun to challenge the VUC membership to not only hone their skills, but redefine them! Ames Prather was a member of the Vance for Governor team but his work schedule has forced him to become a reservist member of VUC --- until he can rejoin as full time active member. In the mean time - he tries to make sure he can compete in tournaments along side the VUC employing a unique style that rivals Brady's and an intensity that rivals Seth's (you should see Ames spar either of those two - order a pizza because you're talking 45 minute matches)! Doug Peterson definititely gets the award for "most improved", by moving from the bottom of the ranks all the way to second place to compete with the leading members in a just few short months. Seemingly the "puppy dog" of the team because of his soft voice don't find yourself fooled - Doug is more a grizzly bear in waiting than a cute fuzzy puppy! Doug has been forced, due to health and employment situations, to become a VUC reservist.